During his afternoon watch, David began having trouble with the autopilot—it refused to hold a heading. After some quick tests, we concluded that the autopilot had quit working. This was a major blow, because even though we have a crew of three people, normally the people just stand watches and the autopilot does all the steering. Although standing at the helm and steering a sailing ship might sound romantic, most people enjoy hand-steering a boat for about 15 minutes; thereafter it gets tedious. And once you get bored, your attention starts to wander and so does the boat. An autopilot never gets bored and its attention never wanders. The boat's Alpha autopilot had done a commendably good job steering the boat over the past 2000+ miles, and it would be a serious loss to have it suddenly pack up and go on vacation. There would be no real risk to the boat, because the regular wheel steering still worked fine. The real blow was to the crew's morale. With a working autopilot, our watchstanding schedule was quite comfortable, typically with a very light workload. In fair weather, most of the time you just sit in the cockpit reading a book. Every hour, you check the GPS and fill in the log sheet, and if the course needs adjusting, you reach over and turn the autopilot dial a little. But now with a broken autopilot we would be on an uncomfortable watch schedule— two hours on, four hours off, round-the-clock, including Marcie. Then we'd have to manually steer the boat continuously, plus handle the other watchstanding tasks like trimming the sails and maintaining the log. Bummer, man! Later when David went off watch, he spent a few hours pulling apart the autopilot, probing voltages, checking wiring, and inspecting the mechanism. He eventually determined that the linear drive mechanism was the culprit, but further testing would require extensive disassembly which is not something you do in a gale. For now, the boat was hove-to with the rudder hard over via the steering wheel, so the autopilot wasn't necessary. Meanwhile, the bad weather continued, though for the time being the boat was riding the steep confused seas reasonably well. While off watch, I stayed below and the motion below, though somewhat uncomfortable and anxiety-inducing, wasn't too bad. But when it was time to change watch and I went topsides, the sight was astounding and I just stood there in the companionway gaping and saying "Jesus Christ!". Looking around, I could see huge steep seas everywhere, many with tops that tumbled forward into foaming crests; other waves came upwards to a sharp point only to have the clear water at the apex whip off and fly away in the wind. Other waves rose up with thick slices of transparent blue-green water at their peaks, beautiful but exceedingly transient sights; immediately the aqua slice would fall over into a tumble of foam. The ocean's surface looked like the tousled wet hair of an angry Neptune. The waves from the gale were not organized into broad parallel and orderly waves like swell. Instead, the gale waves were like giant-sized chop: single or multiple waves, long or short waves, high or low, and of all periods, a completely disorganized and ill-behaved jumble of wind-driven oceanic energy. These gale waves rode on top of the ordinary well-behaved swell waves, significant waves in their own right, making an even bigger mess. All of this oceanic miasma was in constant motion, rolling, tumbling, jumping up and down, and our poor little boat, with us aboard, was bobbing on top of it all, all of us doing the best we could. To tell the truth, I found it to be a frightening experience to see the raw, furious, boat-smashing power of the sea unleashed right before my anxious eyes. Not fun; I repeat, not fun! Seeing such a fury unleashed was very sobering—there is no forgiveness in heavy weather, no second chances or do-overs. Make a serious mistake in conditions like this, and you are doomed. Sorry, Charlie, but that's the way it goes. There is absolutely no forgiveness or compassion on the face of Neptune today, only uncaring wrath and ire. This experience also gave me pause when thinking about life rafts. You think of a life raft as a "safe" way out in case disaster strikes. But in a significant storm a life raft would be like a toy, thrown around and blown over; waves would swamp it and tumble it over and over. Under these conditions, a life raft could hardly be considered a safe haven; it would be much better to stay on the boat as long as the boat was afloat. Of course if the boat sinks, you don't have any choice, inflate the life raft and jump in. You can only hope that the life raft isn't bashed to pieces slamming into the boat after you inflate it, or torn away by the winds and waves. Then you have to hope you can get into the life raft. You likely would get only one chance, and if you tried but failed to enter the life raft, missing by inches, you quite possibly could be swept away and lost. I am forced to conclude that a life raft is for when your boat sinks in mild weather. In a storm, a life raft may just be wishful thinking. 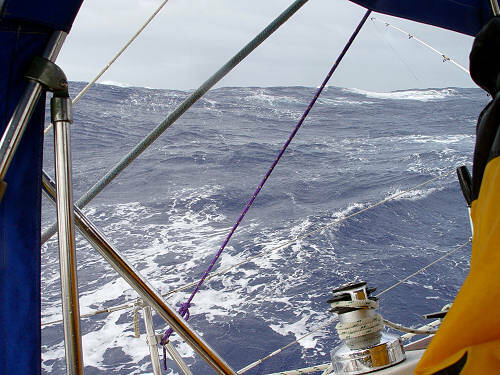 This was my first experience with genuine heavy weather on a sailboat; all my other bad weather experiences have been mild by comparison. Most of my boating experience has been on the protected waters of Chesapeake Bay or the Intracoastal Waterway. I have ventured offshore on a number of occasions while coastal cruising along the East Coast. With this type of cruising, you have the advantage of reliable weather forecasts and nearby safe harbors. If bad weather is forecast, just stay in port. If you do get caught out in bad weather, the VHF weather radio usually gives you enough warning to avoid the worst of it, which gives you enough time to duck into a nearby safe harbor. 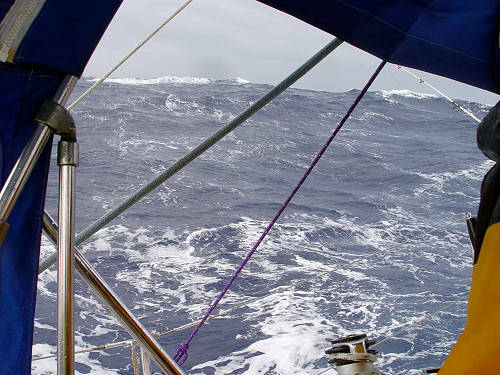 On a long ocean passage, though, it is more difficult to avoid bad weather. The best way is to choose a season and take a route where there is little chance of storminess, but this is sometimes hard to arrange. We are traveling to 33° South, close enough to the Roaring Forties (although certainly not in them) that we can be adversely affected by the intense storms that track well to the south of us. Also, we are traveling in the beginning of the Southern Hemisphere winter, when there is more stormy weather and it penetrates farther north. In theory, we perhaps could have taken a different route or left earlier in the season, but there are always tradeoffs (like increasing the duration and cost of the voyage, or even having to postpone a voyage until the next season). As cruisers, we have to evaluate all the tradeoffs, and it sometimes turns out that the most reasonable plan includes some risk of heavy weather. Another way to avoid bad weather is to keep an eye on the regional and global weather forecasts, since much of the weather follows predictable patterns. You might be able to get a day or two of warning, and head in a direction to minimize the adverse effects. Even if you can't get out of the way, at least you could know how big the storm is and how long it will last. As I mentioned before, we are currently unable to receive weather faxes, so we have to cope with the basic uncertainties, which for me, in the present situation, translates into anxiety over fear of the unknown. Frankly, for this gale, the adverse effects of the anxiety (can't sleep, no appetite, feel poorly and stressed-out) were much worse than the effects of the storm.